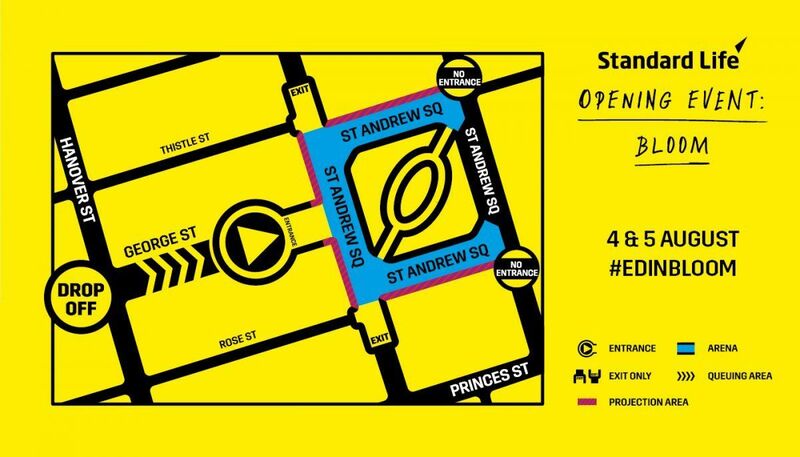 Entrances and ticket check points for the St Andrew Square arena will be on George Street from the east end of George Street and Hanover Street. A map of the arena including entrances and exits is below. You will be free to move around the roads around St Andrew Square (which will be closed to traffic). Projections will be on the surrounding buildings and you'll get a different experience in every spot around the Square! The following roads will be closed on both nights of the Standard Life Opening Event: Bloom until 1.00am the following morning. Edinburgh is very compact, which makes it ideal to explore on foot or by bicycle. The City of Edinburgh Council is an excellent source of information on cycle paths and routes, bike security and bike parking options. Edinburgh’s central train station, Waverley Station, is only a 5-minute walk from the St Andrew Square arena and enjoys frequent direct train services from Glasgow, Dundee, London, Newcastle, Birmingham, Manchester and other towns and cities in Scotland and beyond. You can find out more about travelling to Edinburgh by train here. The Edinburgh Trams runs a frequent service from Edinburgh Airport to York Place in the city centre. The closest tram stop to the arena is Princes Street as the St Andrew Square stop will be closed from 9.00pm during the event. Find out the latest information about the Edinburgh Trams here. Visit Lothian Buses for up-to-date information on all local buses including Edinburgh Bus Tours, Airlink, Edinburgh Shuttle and Night Buses. The nearest taxi ranks are on Hanover Street and Waverley Bridge. We strongly recommend that where possible, you leave your car behind and either walk, cycle, or use public transport to get to the Standard Life Opening Event: Bloom. Parking in the city centre is limited, but there are some pay and display on-street parking opportunities around the city. You can find out more information about parking on the City of Edinburgh Council website.